I must admit I had never heard of Tandoor Chef Pizza until a trip to my local Fresh Market grocery store. While browsing through the freezer section, I noticed a picture of an oblong-shaped pizza on a package labeled "The Original Naan Pizza". I asked myself (and there might be a few others out there reading this asking the same thing! 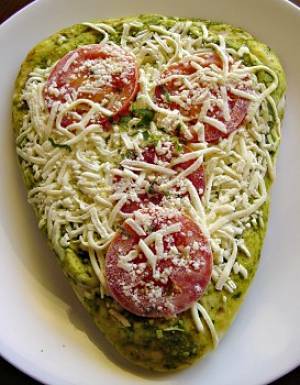 ), what is a Naan pizza? Turns out "Naan" is an Indian word for bread baked in a traditional Tandoor, a circular metal or clay oven. Baking in this particular method produces bubbling air pockets in the dough, creating wonderfully textured pizzas and flatbreads. Another plus is that Tandoor bills their dough as "hand-stretched". I don't know about you, but to me, there's something very gratifying about knowing that humans versus machines are stretching out our dough!! 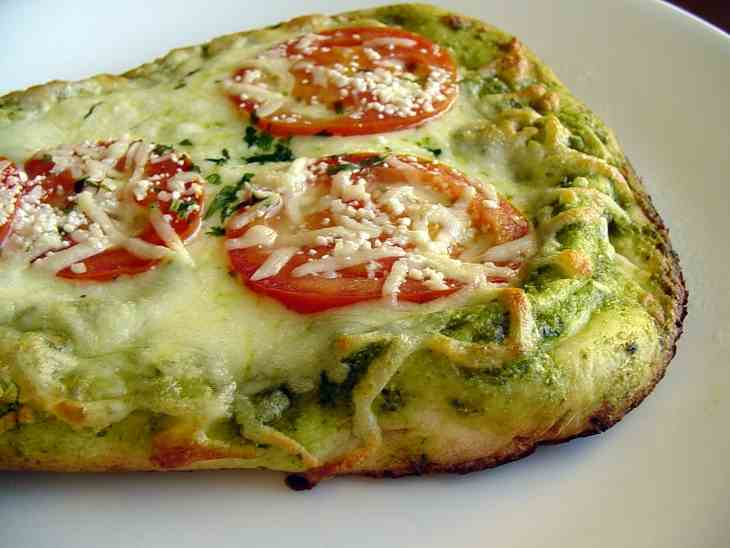 I chose Tandoor's Cilantro Pesto pizza for my first taste of "Naan". What struck me when I removed the pizza from the box was the fact that it looked, well... shall we say... very green! And the shape of it, as you can see, is somewhere between an oval and a triangle. Upon reading the ingredients I realized that cilantro, or coriander, completely replaces basil in the pesto. 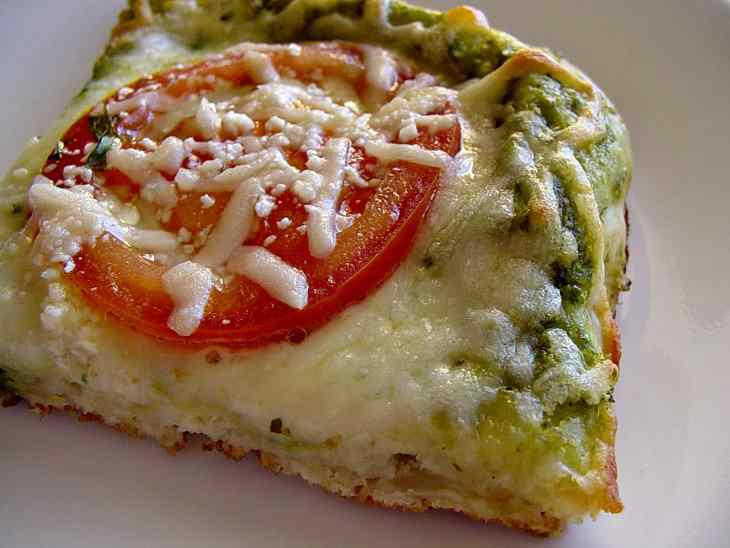 Hence the very green, herb-encrusted dough. The directions say you can cook from frozen directly on an oven rack, or in a pan for a slightly softer texture. Because my oven is a "hot" oven, I chose the pan method over the rack. So what does it taste like? Well, to start out, cilantro pesto as compared to the regular basil pesto creates a whole new dimension for your taste buds. I found this pizza to be an unusual combination of flavors—a bit of hot and spicy in the Indian tradition, luxuriously melting into the buffalo mozzarella and tomatoes. See those raised pockets around the rim of the crust? What an exceptional texture—very thin in some places, and in others, puffed up with airy, yeasty, pulled-apart goodness! Tandoor Chef makes a variety of pizzas and flavored Naan with traditional and some not-so-traditional ingredients like eggplant, jalapeno, and paneer cheese. This delectable frozen pizza line is a keeper in my book!